Fashion rules are made to be broken. I am not a rule type of girl to begin with...the one rule I do follow when it comes to fashion is to be in good taste. You can be edgy, you can be original, you can do you, but always do it well. Wearing white seems to be one of those things that come with way too many stipulations. Don't wear white before Memorial Day, or after Labor Day, for instance. And don't mix white and cream together. Although I threw the holiday/white rule out the window a zillion years ago, I think I might of believed that last one for longer than I should. But one day when I was looking for inspiration and lightness in my closet, I noticed I have a lot of variations of the tones of white in my wardrobe. 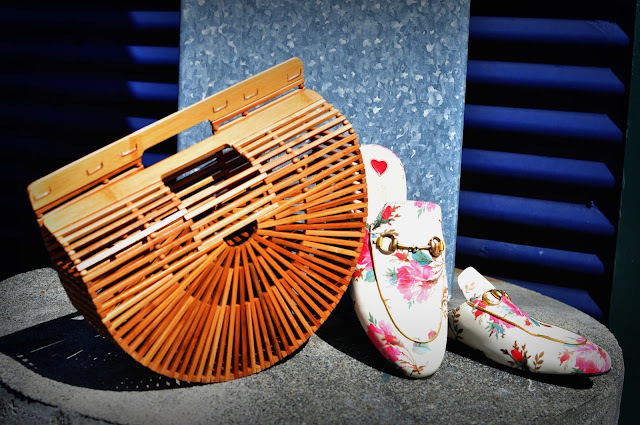 So why not mix them together with some of my summery pieces? Here are my favorite white pieces for summer and beyond. While my white Joie Saleema Booties (on sale on Shopbop right now!) look bright white next to dark denim, mixing them with a cream pair of MOTHER Denim Tomcat Roller Chew jeans in the color "Unnatural Acts" changed their tone completely. Since MOTHER is one of my very favorite denim lines, I was super excited to add this off white pair to my wardrobe. The color is chic and cool and will look beautiful all summer as well as into fall with cozy sweaters and boots. I love the edgy uneven hem and the wide flare. Oh, and the high rise and button front give them a modern take on that 70s vibe. 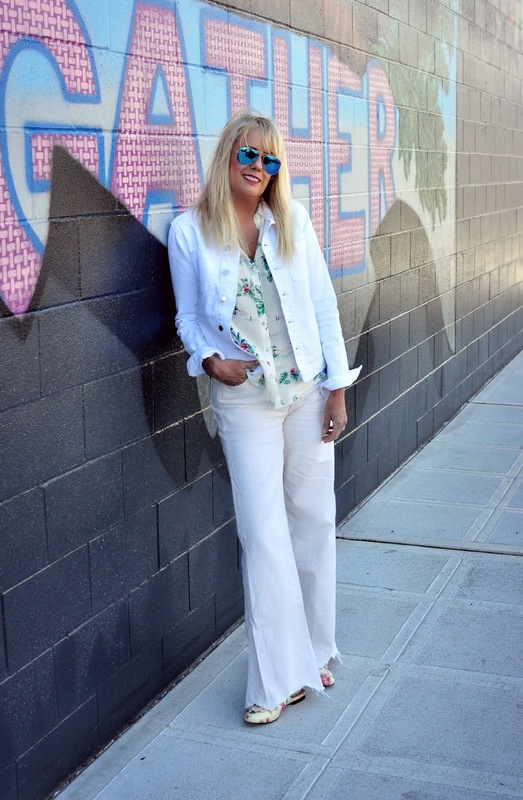 I am all over the white denim jacket this summer. It is my obsession, so I keep telling people, if you don't have one, get one. Wear it over a summer dress, or a tropical print shirt, like this one from Sézane, or even better, button it up and wear it as a top instead of a jacket. My L'Agence Celine Distressed Jacket has a bit of worn in appeal and the perfect amount of stretch, which makes me wear it more than I probably should. 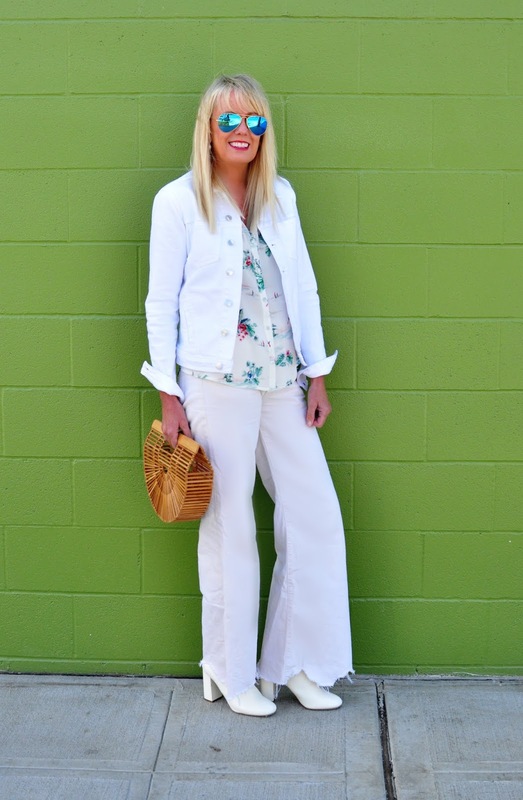 White denim jackets can be found everywhere from high end to fast fashion, so there are great choices to fit every budget. I love this Zara one with it's cropped silhouette, and this Levi's Trucker Jacket from the Levi's® Altered Collection is reimagined as collarless with raw edges. The Target A New Day White Denim Jacket is both on trend and a budget friendly $29.99. For a more 80s feel, try the Madewell Boxy-Crop Jean Jacket in Tile White. It has a retro vibe with its slightly roomier fit, which I love. Under a more avant guard take on things, I am obsessed with the Isabel Marant Rena Jacket, with stunning broderie-anglaise panels and a relaxed, cropped shape. I can't always rock high shoes so wearing a fabulous pair of mules is great alternative. These Gucci Princetown Floral-Print Flat Mule Loafers were a splurge, but if you play the cost per wear game in your head, well, you can justify it. Or I can, anyhow. ;) And of course one of my favorite summer bags is the Ark Handbag that I bought at the MoMA Design Store in New York City. This store is one of my favorite stops for gifts and cool finds when I visit the Big Apple.You can spend hours in there and there is something for everyone. The cool Ark bamboo bag, a modern take on a traditional Japanese lunch bag, is the quintessential summer clutch. It also comes in a multicolored rainbow acrylic version. Both knock it out of the style park. Mixing whites and creams is the ultimate in chic. It has a fresh modern vibe that is unexpected. Add in summery fabrics and accessories with an equally light feel, like florals and wicker, gingham, linen, stripes and bamboo....then you have yourself the perfect perspective for a ton of gorgeous summer looks. 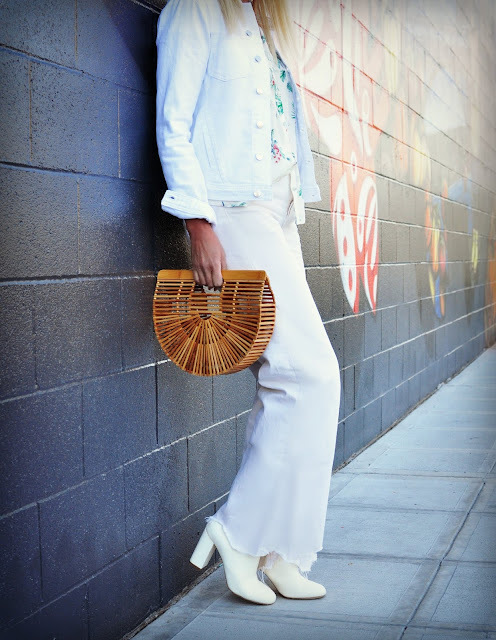 The white denim jacket elevates casual pieces, while mixing tone and texture lend a luxury to even the most laid back of looks.